Jack Fellows Hand Signed and Numbered Limited Edition Print on Paper: "Mission-to-Babo"
About the Artist: Although the Japanese-held airfield at Babo, on the Vogelkop Peninsula of Dutch New Guinea had become a backwater in the war in the Southwest Pacific, enough enemy activity remained that the 5th USAAF planners considered it necessary to raid the facility on 9 July, 1944, and risk the fearsome defensive anti-aircraft capabilities of the area. 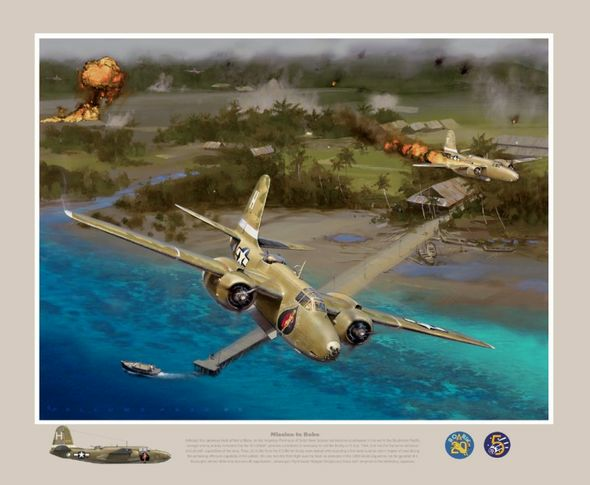 Thus, 24 A-20's from the 312 Bomb Group were tasked with executing a low-level surprise raid in hopes of neutralizing the remaining offensive capability of the airfield. We see here the third flight over the field, as elements of the 389th Bomb Squadron run the gauntlet of a thoroughly alerted defensive anti-aircraft organization, whereupon flight leader Hedges (foreground) loses both wingmen to the defending Japanese.